Arthur Kennedy, one of the premier character actors in American film from the late 1940s through the early 1960s, achieved fame in the role of Biff in Elia Kazan's historic production of Arthur Miller's Pultizer-Prize winning play "Death of a Salesman." Although he was not selected to recreate the role on screen, he won one Best Actor and four Best Supporting Academy Award nominations between 1949 and 1959 and ranked as one of Hollywood's finest players. Born John Arthur Kennedy to a dentist and his wife on February 17, 1914 in Worcester, Massachusetts. As a young man, known as "Johnny" to his friends, studied drama at the Carnegie Institute of Technology. By the time he was 20 years old, he was involved in local theatrical groups. 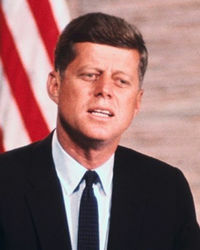 Kennedy's first professional gig was was with the Globe Theatre Company, which toured the Midwest offering abbreviated versions of Shakespearian plays. Shakesperian star Maurice Evans hired Kennedy for his company, with which he appeared in the Broadway production of "Richard II" in 1937. While performing in Evans' repertory company, Kennedy also worked in the Federal Theatre project. Arthur Kennedy made his Broadway debut in "Everywhere I Roam" in 1938, the same year that he married Mary Cheffrey, who would remain his wife until her death in 1975. He also appeared on Broadway in "Life and Death of an American" in 1939 and in "An International Incident" in 1940 at the Ethel Barrymore Theatre, in support of the great American actress the theater had been named after. Kennedy and his wife moved west to Los Angeles, California in 1938, and it was while acting on the stage in L.A. that he was discovered by fellow Irish-American actor James Cagney, who cast him as his brother in the film City for Conquest (1940). The role brought with it a contract with Warner Bros., and the studio put him in supporting roles in some prestigious movies, including High Sierra (1941), the film that made Humphrey Bogart a star, They Died with Their Boots On (1941) with Errol Flynn, and Howard Hawks's Air Force (1943) alongside future Best Supporting Actor Oscar winner Gig Young and the great John Garfield. His career was interrupted by military service in World War Two. After the war, Kennedy went back to the Broadway stage, where he gained a reputation as an actor's actor, appearing in Arthur Miller's 1947 Tony Award-winning play "All My Sons," which was directed by Kazan. He played John Proctor in the original production of Miller's reflection on McCarthyism, "The Crucible" - which Kazan, an informer who prostrated himself before the forces of McCarthyism, refused to direct - and also appeared in Miller's last Broadway triumph, "The Price." When Kennedy returned to film work, he quickly distinguished himself as one of the best and most talented of supporting actors & character leads, appearing in such major films as Boomerang! (1947), Champion (1949) (for which he received his first Oscar nomination as Best Supporting Actor) and The Glass Menagerie (1950), playing Tom in a mediocre adaptation of Tennessee Williams's classic play. Kennedy won his first and only Best Actor nomination for Bright Victory (1951), playing a blinded vet, a role for which he won the New York Film Critics Circle award over such competition as Marlon Brando and Humphrey Bogart. Other films included Fritz Lang's 'Rancho Notorious (1951)', Anthony Mann's Bend of the River (1952), William Wyler's The Desperate Hours (1955), Richard Brooks' Elmer Gantry (1960), David Lean's Lawrence of Arabia (1962), and John Ford's Cheyenne Autumn (1964). 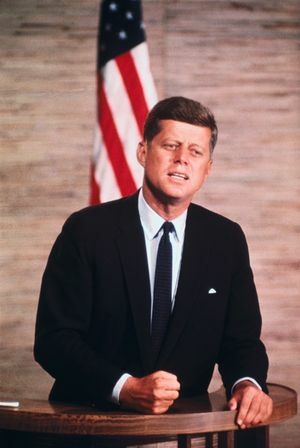 In 1956, Kennedy won another Best Supporting Actor Oscar nomination for his role in Trial (1955), plus two more Supporting nods in 1958 and 1959 for his appearances in the screen adaptations of Grace Metalious's Peyton Place (1957), and James Jones Some Came Running (1958). Kennedy returned to Broadway frequently in the 1950s, and headlined the 1952 play "See the Jaguar", a flop best remembered for giving a young actor named James Dean one of his first important parts. A decade later, Kennedy replaced his good friend Anthony Quinn in the Broadway production of "Becket", alternating the roles of Becket and Henry II with Laurence Olivier, who was quite fond of working with him. In the 1960s, the prestigious movie parts dried up as he matured, but he continued working in movies and on TV until he retired in the mid-1980s. He moved out of Los Angeles to live with family members in Connecticut. In the last years of his life, he was afflicted with thyroid cancer and eye disease. He died of a brain tumor at 75, survived by his two children by his wife Mary, Terence and actress Laurie Kennedy. He is buried at Woodlawn Cemetery in Lequille, Nova Scotia, Canada. 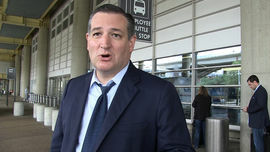 Ted Cruz to Trump: Release the JFK Files, My Fam's Got Nothing to Hide!